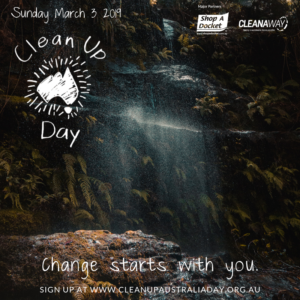 Clean Up Australia Day 2019 is on Sunday 3 March 2019. Have you registered yet? 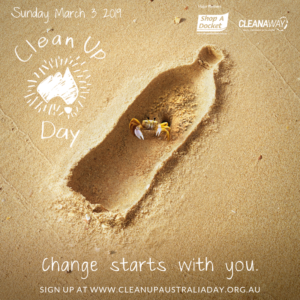 There are a number of ways to be part of Clean Up Australia Day. Whether you want to go out and about and do a Clean Up or donate to the organisation, get involved today. You can find out more information about Clean Up Australia Day 2019 on the Clean Up Australia Day website and see below for details how to join in. All you have to do is go through the registration process, selecting your Guide Unit or Group as a Youth Group option (this will veto the requirement for a Waiver to be signed online) and Clean Up Australia will send you all the materials you need. Whether Guides created a new Clean Up Site or joined an existing one, Clean Up Australia will offer you a set of tools to promote it to your friends and family. Spread the word and make your Clean Up Day even more successful. Last but not least, conduct your Clean Up. Make sure as a Site Coordinator you have organised all necessary arrangements and as a volunteer you show up on Clean Up Australia Day. Have lots of fun. For more information head over to the Clean Up Australia Youth Resources page. An estimated 7 billion cigarette butts end up in Australian waterways, streets and parklands each year. 80 million plastic bags are dumped in Australia each year – creating a serious threat to our precious marine life. Recyclable material makes up almost 80% of total household waste in Australia. For over two decades, Australians have devoted more than 27.2 million hours towards the environment through Clean Up Australia Day and collected over 288,650 tonnes of rubbish. Guides identified Climate change as their number one global issue of concern in the Girl Guides Australia, Guides say…Project with water and environment issues as their number one national issues of concern. Guides are encouraged to participate in CUA events and to register your events each year on the CUA website or calling 1800 CUA DAY (1800 282 329). All registered Guide Units will get access to the kids clean up kit. To minimise waste CUA will give each Unit a logon code so they can download these resources from the CUA website. Alternatively you can request them by phone. “Recycling is a simple but effective way to reduce greenhouse gas emissions,” Mr Kiernan said.